Before I start with my topic for the day, I want to announce a new Novel Matters book club. I'm reading Writing 21st Century Fiction: High Impact Techniques for Exceptional Storytelling by Donald Maas. I'm loving what he has to say so far about the death of genre, and I would love to chat with you, my most respected writing friends, about his ideas. The next couple of months aren't the best time to start a new project like this, so I'm thinking January. You can ask for the book for Christmas and read chapter one while munching on Christmas-tree shaped cookies. We'll talk in January. Last time I posted here, I highlighted James Scott Bell's marketing book for ebooks. This is the journey I'm on with my next novel, so I'm happy to share what I'm learning along the way. After all, authors do most of the marketing for their books whether they're working with a legacy publisher or going indie like me. Bell echoed the approach many of us have heard at writers conferences--building a platform and social media networking, plus pricing strategies and more--but with the knowledge to do a great job for our books. The book is full of wisdom I intend to use in marketing Goodness & Mercy. But to become a market genius before March--that's my goal--I can't stop at one book or opinion. Trust me, there are tons of ebooks out there to help you sell your ebooks on Amazon. And you have to be careful which ones you bet the success of your book on. Some of these how-to books are written by authors who have experienced major success with their Kindle ebooks. One book. One big success? Is their success a fluke? Do they come from a large family that owns many Swiss bank accounts? 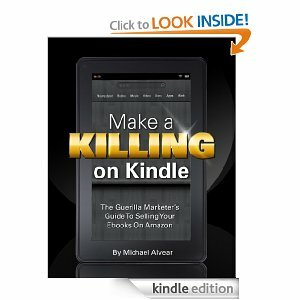 I chose a book by Michael Alvear because he takes a totally different approach to marketing ebooks. Also, his book has the longest, most specific title ever. I knew what I was getting! Check this out: Make a Killing on Kindle without Blogging, Facebook and Twitter: The Guerilla Marketer's Guide to Selling Ebooks on Amazon. Phew! Of course, we have to ask, "Just how do you sell books on Amazon without social media or full-page magazine ads?" Alvear believes it's all about understanding the ecosystem of Kindle with the objective of optimizing the position of your book. That way the readers who are most likely to buy the book will see it as they browse. This kind of thinking is so rare in book marketing that Alvear gives an example with his own book. At first, he tried to market conventionally through social media. After five years of work, he got 25,000 unique visits to his blog per month. Of those, 5,000 went to his book page. To determine the "conversion rate," meaning how many views it took to make a sale, he divided the number of sales by the number of visitors. Alvear came in right in the middle of the industry average at 1%. That's only 50 books per month for all those years of work. And so, Alvear systematically goes through every aspect of developing your book for market to make it rise to the top of pile. He promises everything can be done in 18 hours. This also appealed to me. But you have to start with a stellar book that you believe in. Otherwise, all the marketing in the world won't produce satisfactory results. So far, I'm listening carefully to this guy. Here are some of the topics he examines in his confident, been-there-more-than-once voice. I should tell you that he has 20 years of marketing experience. Ya gotta love credentials. 1. Create an attention-getting title. If the title doesn't work, you can always change it. That's one nice thing about digital publishing. 2. Hire a professional to design you book cover. Really? In an ideal world, yes because your cover in all of its 7/8" x 1" glory in Kindle-land needs to make a punch, a promise, and a come-hither message.I hired a photographer and a graphic designer, but I'm the art director. Probably a bad idea. I'm hoping not. Alvear does give guidelines for hiring these professionals, depending on your budget from low to high. "If you have already passed that hurdle of having a customer be attracted to the cover, and then they pick up the books," said Patricia Bostelman, vice president for marketing at Barnes & Noble, "an enormous battle has been won." 3. Once you have a visual hook for your potential reader, you want to set up your book to gain top search engine results every time someone looks for a book in your category. I sure hope I understand this better by the time I'm launching my book. Alvear isn't stingy on pointing authors to places where keyword phrases can be embedded, so the chances of your book popping up in the first page of results increase. Keyword phrases, who knew? "You are destined to fail if you don't use keyword phrases that lead to your book." So, I guess I better learn. 4. Beyond keyword phrases, Amazon lets you choose two categories for your book. "Think of [categories] as the section of the bookstore you'd like your book placed (literature, fiction, history, etc.)." From working in both a bookstore and a library, I know how important these categories are. Most reader beeline to their favorite genre and do very little browsing. There are browsers--God bless 'em!--who wander the whole store. That makes your cover and title even more important. Alvear's book gives me hope. There are things I can do to get my book before the reader. For instance, he explains how to put a billboard for your book on a competitors pages. And he talks about the power of great reviews, even how many you need to make your book page a powerful selling tool. One chapter deals with how to write ocean-front book descriptions, another highlights the importance of formatting and using the "Look Inside" feature. And then he tells about a feature in Kindle I'd never seen before that will definitely effect the way I format my book. It's the "Before You Go" feature. If your reader's Kindle or other reading device is set up to Facebook and Twitter, you can ask your reader to kindly rate the book and share with their friends right there and then. Aha, there is a place for social media! Alvear does recognize the value of social media once the book is successfully launched and selling. Your readers will be curious about you and will want to find you online. Then a blog makes tons of sense. I plan on using Alvear's ideas to optimize the chances that Goodness & Mercy will have its best chance of finding an audience. Michael Alvear doesn't write the kind of books (other than this one) most of us read, but he seems to have a good handle on what it takes to sell on Amazon. I appreciate that about him very much. Next time, I'll be talking about yet another marketing philosophy. And then I'm formulating a plan for full speed ahead marketing. My brain is getting full. Have you worked with a graphic professional? What's your take on Alvear's approach, knowing that I was only able to present the briefest details? I'm looking at this information as power, not an insurance police, success isn't following a formula, but it is knowing how the game is played. Can you recommend what I should read about marketing next? I know little to nothing about this topic but as an avid reader, I know what I look for. In bookstores I'm a browser. I'm also a goodreads fan and I read 1-star reviews first and 5-stars last or not at all. A great cover might catch my attention but a plain cover won't put me off in the least. Titles grab me, perhaps more than anything. That book description is all important because ff there's a grammatical or spelling error, or if the description is wordy or too long, the author's writing style becomes suspect. Sometimes it intrigues me if a book is compared to a more familiar book ("In the Tradition of Jane Eyre), if it's worded in such a way that the author doesn't sound like she's bragging. On ebooks, when I try the "look inside" feature, I don't like to scroll through a bunch of praise and 5-star reviews. I can look at those elsewhere; now I just want to sample the author's writing style and see if I like the voice. I am not positive I'm trying to be helpful with this comment; I may have merely used your post as an excuse to ramble about books. Indulge me. Keyword phrases? Do people actually google topics in fiction? Where do you embed them, anyway...in the text? I vaguely understand SEOs, but this is so much to learn. Well done Patti. You are a brave lady. I tend to browse in book shops but search for either specific titles or authors on Kindle. And yes, I judge books by their covers pretty much all the time. So. Much. To. Learn! Did I say you were brave? I'll say it again. You are brave! And thanks so much for sharing your findings. Roseanna White at WhiteFire designed the cover for "Paint Chips". I could not be happier with it. It looks good both small and large. For that, I am most grateful. Were I to ever got completely Indy, I have plenty of artist friends and family to help. I'm glad that you mentioned that success isn't found in a formula. I think that our culture tends to want a 10 step plan to "making it". If it can be 5 steps, all the better. This all takes lots and lots of work. But if we are smart about it, we can manipulate technology to work for us. Patti, I know that your upcoming release is going to be fantastic. I can't wait to help promote it. Wanderer: To the contrary, you've been very helpful. You're 100% correct about the book description. It has to be the best writing the author has ever done, certainly not an afterthought. Also, the Alvear agrees with you about the "Look Inside" feature. Get your writing on the first page. That's what people want to see. All that other stuff? How about posted it on your blog? Megan: You have no idea how steep this learning curve is for me. I'm thankful people who have explored the unknown country of independent publishing are sending back messages about what they've learned. I didn't have the gumption to go through all the pricing strategies Alvear presents. Oh my! Basically, you try to make an educated guess and then you can adjust as needed. 18 hours indeed! Thanks for thinking I'm brave. I think you're seeing dogged determination and a bit of desperation, easily mistaken for bravery. Susie, your cover is PERFECT! Very appealing visually and aesthetically. I'm going to write your designer's name down. She's good. I like your caveat, "If we are smart..." Working at it! 50 books a month for 5 years?! I'd be happy with that. But I know reality is 1000 books the first month and maybe 5 every other month from then on. Our culture is always moving on to the new thing. Changing the title every year betrays readers. I want to write a book that is passed down from mothers to daughters, discussed around campfires and family reunions and chosen regularly from book cases for many generations. Therefore I craft. I saw a sign in a book shop yesterday. "Books are no more intimidated by Kindle than escalators are by elevators." It should have been 'stairs are by elevators' but you get the sentiment. Thanks for sharing Patti! I glean while I craft because it might be God's plan to publish this work before I die. I'm not fussed about the when. Yes, I admit to picking up a book because of a cover, "a picture paints a thousand words," type of cover. I also happily pick up non-descript old looking books because of an attention getting title or the author's name. Rarely do I shop for (unknown) fiction by key word or genre I mean, how do you know what issues will be dealt with until you begin the first chapter and are swept in? I am rather a haphazard and accidental reader, though I live the rest of my life intentionally. Books can be a best seller and I will not be aware of them until someone trades or loans me. On the other hand, I have stumbled on some marvelous, well-written reads that never became household words. Henrietta, I apologize. I wasn't clear about the sales numbers. Alvear blogged for five years prior to adding his book for sale. Even though he made some money. It wasn't enough to live on. As to people moving on quickly, yes. But the books that persist on the New York Times Bestsellers list are not the titles you would expect. Oh sure, Patterson and Steele will top the list for three weeks, but the stories that stay and stay are books like Water for Elephants, The Secret Life of Bees, and The Help. These are beautifully crafted books. These are the kind of stories Maas talks about int he book we'll be doing as a book club in January. So, keep crafting Henrietta. A great story is the beginning point. The rest of this is making sure your story is read. Henrietta, we're waiting for your story. Cherry: Key words or phrases are like, Historical, romance, Colorado, inspiration, etc. These words or phrases placed in your book's description and categories helps those people who are browsing digitally to find your story. I love haphazard readers. They're very interesting people, just like you. My husband is a design professional. It's amazing to see the thought and detail a good designer will put into every aspect of his design always keeping the end user in mind. And these days, yes, keywords are important. Search engines are an interesting and complicated beast, but they can really work for you. I think it's great that Alvear explained these 2 areas for authors. It's definitely not part of our normal realm of thinking. Amelia: Thanks for your perspective. My goal is to earn enough from Goodness & Mercy to do an even better job for the next book, that means a design professional for the cover and the formatting. I'm with Cherry. A cover is what attracts my attention. A title draws me in, and the book description sells me. Not a job for amateurs. I've been marketing four eBooks since March. Two suggestions- visit Hootsuite.com - learn how to use their tool. (they have their own University) it's one of the keys. Also visit Kindle Direct it's a constant learning requirement. How can I get involved in that book club in January? I love Donald Maas. I have "The Fire in Fiction" that I intend to re-read every year. It's so good. I wrote the name of the book, but would love to join the book club discussion.